Vishnu stuti or Vishnu stotram is the recitation (or chanting) of verses in praise of Lord Vishnu or Srimannarayana God. There are basically three most popular verses that are recited daily at homes in praise of Vishnu stuti. These slokas are generally recited after doing worship with the 24 names of Vishnu known as "Keshava Naamaa-s". So, below are the lyrics presented first in Hindi, then in English Text, and thereafter, in the Telugu language. After that, the full meanings in the English language are also provided. eka means'one or only' and naatham means' lord'). I offer my salutations to that Vishnu, who is of peaceful or serene appearance, one who sleeps on a serpent, one who has lotus as his navel and is the lord of Devas or angels, who is embodiment of the universe and sky shaped, whose colour is like that of clouds, whose body is auspicious, who is having Goddess Laxmi as his consort, whose eyes are like lotus and who is not understandable even to sages, one who removes the fears of worldly beings and who is the only lord of all lokas or universes. megha = cloud, shyaamam= dark colour, pita kauseyam = yellow dress, vaasam = abode or one who resides in, srivatsa = srivatsa mark or sign, aangkam = having on the chest, kaustubha = the jewel of kaustubha, udbhaasita = shining, angam = bodied, punya = holi or pure, oupetam = encircled with, pundarika = lotus petal, aayata = extension, aksham = eyed, vande = to respect or salute, sarva loka = all lokas, ekanaatham = one Lord. I offer my salutations to Vishnu, the Lord of all lords, who is cloud hued, and who is dressed in yellow silk garments, whose chest bears the mark of srivatsa emblem, whose body glows with the kaustubha jewel, who is embodied with holiness, and whose eyes are wide like lotus petals. 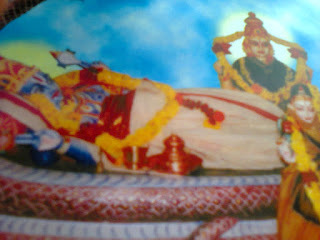 namaami = saluting, Vishnum = to Vishnu, sirasaa = with my head, chaturbhujam = four armed. I salute by bowing my head to that four armed Vishnu, who holds the conch (named as paanchajanya) in one hand and the holy wheel (known as Sudarshan chakra) in another hand, one who is adorned with a beautiful crown and earrings, and dressed in yellow golden-silk dhoti, one who has lotus like eyes and is wearing a garland with a kaustubha mani (jewel) on his chest. So, these are the three popular slokas recited daily during prayers for Vishnu. In the next post, I will tell you about the Lakshmi stuthi or slokas recited addressing Goddess Lakshmi.